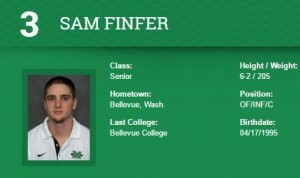 When the Los Angeles Dodgers drafted catcher Sam Finfer out of high school in 2013, nabbing him in the 29th round, the Bellevue, WA, native took a pass. Thus began a collegiate odyssey that took him from Seattle University and Bellevue College to Marshall University. After a lackluster junior year at Marshall, where Finfer hit .218 with 7 HRs, 27 RBIs and 4 doubles, MLB teams ignored him in the 2016 amateur draft. Then came 2017. Splitting his time between outfield and catcher, the 22-year-old supersized nearly all of his stats, finishing the season with a .338 batting average in 201 at-bats, 18 HRs (tied for 13th-most among all NCAA Division I players), 51 RBIs, 17 doubles, and 8 thefts in 9 tries. Finfer’s average, on-base and slugging percentages (.338/.410/.692) were even better with runners in scoring position (.393/.500/.714). The 6’2″, 205-pounder was even more of a home-run threat in 2017 than his overall total suggests. Finfer ranked 8th among D1 players in HRs per game (0.35), thanks in part to three multi-homer outings. No wonder he was named All-Conference First Team last week by Conference USA. How high Finfer will go in next month’s draft is unclear. Baseball America did not include him in its recent ranking of of top 200 draft prospects. But the Dodgers are starting to look pretty smart.